We specialise in classical crossover singers and musicians but also represent artists from many other music genres. Based in London but travelling worldwide our artists are highly trained, experienced and professional.If you do not find the act you require on our website please call or email us and we will gladly assist you. We bring charm and magic to your events by providing entertainment of the highest quality. We have an elite selection of artists on our team who are immensely gifted and truly talented performers. Our agency is invitation only , we believe in quality rather than quantity therefore you are guaranteed to have performers of the highest calibre for your event. Add that extra touch of magic to your special day… Why not book one of our singers or musicians for your wedding ceremony. Stand Proud Music was founded by one of our artistes , Gemma Ashley. As a successful event and wedding singer, Gemma has years of experience in the industry and always wanted to create an agency that was unique and remarkable. With specialisation in the classical crossover genre, Gemma resolved to set up her own company that would further cater to the requirements of clients from all walks of life. For more information about our services or to learn about our artists, get in touch with us! 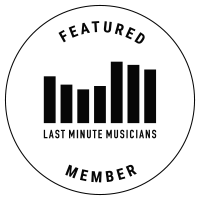 We are proud to be featured member of LMM. Click on the badge below for more information.